Performers include: Julie Klausner, Billy Eichner, James Urbaniak, and Andrea Martin. A single camera comedy, this series was created by co-star Julie Klausner. It follows two comedian best friends who are trying to make it in New York City. They hate everyone — except each other. Billy (Billy Eichner) works as an unenthusiastic waiter while he tries to get work in comedy. Nate (Derrick Baskin) and Denise (Gabourey Sidibe) are the married couple who co-own the cafe where Billy works. Matthew (Cole Escola) is a co-worker that Billy despises. Julie Kessler (Julie Klausner) is Billy’s best friend and is also an aspiring comedian. Her days are mainly spent stirring up trouble at the workplace of her boyfriend Arthur Tack (James Urbaniak) while also trying to land comedy work. Marilyn Kessler (Andrea Martin) is her mother. Billy moves to Los Angeles with Julie’s help. Marilyn writes a best-selling memoir, also with Julie’s help. Changes at the cafe include a new waiter, and eventually, new ownership. Arthur’s office in Florida meets an untimely demise. First aired: September 26, 2017. What do you think? 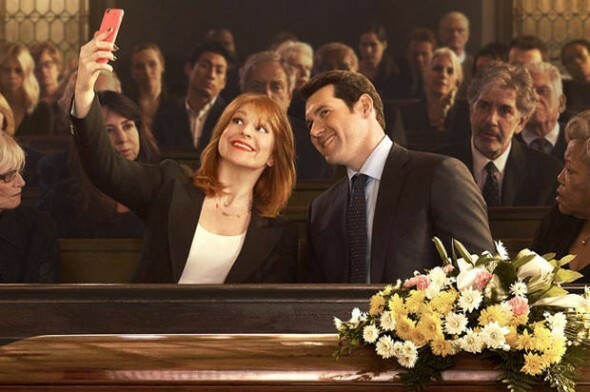 Do you like the Difficult People TV show? Do you think it should have been cancelled or renewed for a fourth season? I LOVE this show! I just discovered it, and I can’t stop watching. I’m into Season 2 and I don’t want to get to 3 because then it will be OVER. NOOOOOO. It must be renewed!! Best show on TV! One of my most favorite shows ever.